This is my great grandmother, she was alive during my life time because I remember my grandmother Anna Bartels Schridde going to Germany to see her. My grandmother would send pictures of the grandchildren to her mother. I guess somewhere in Germany people are looking at those and wondering who these children are…..
What I need to find out and can not do it is read the dates on the tombstone. If anyone out there has any ideas on how to do that please leave me a comment. The next thing after that will be do determine the location of the cemetery and find where her husband Daniel Matthias Bartels is buried. Is he in the same place as Maria?? Maria was born in Jena, Germany. Maria as a young woman. This is another item that my father had squirreled away in his file cabinets. This is the funeral card of his father and also my grandfather, Thomas Dowd. The amazing thing to me is that this card is eighty nine years old. The story is that he had fallen down a flight of steps and then went to bed, the next morning he had died. Right now I am sure it must have been a SUBDURAL HEMATOMA I feel somehow cheated that I had never met either of my grandfathers. I also think it was very difficult for my father to grow up without him. I have to send for his death certificate, one of the many things that I continue to procrastinate about doing. 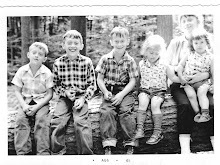 My cousin, Helen Jean, was the person who inspired me to get involved in Genealogy. She has been working on it for about 20 to 30 years. One of her brick walls (my husbands and daughters line) is Michael Coleman. Helen Jeans has him traced to Center County PA with his birth c. 1812. Helen Jean had copied that information from a family bible. Michael had written mother and father but no name. Guess he knew what their names were...... I have to ask her who owns the Bible and where is it now? I found information in the Lebanon County Historical Society.....This county is about two counties east of where Michael was found and is buried. The information is that a Coleman Family was very important in that county. Seems the original Robert Coleman emigrated from Ireland and lived in Philadelphia in the early 1700's. This is copy of my parents marriage certificate. They were married before my father got shipped off to England during World War II. They spent five days together before his deployment. His job was aircraft repair. Before the war he was a laborer with the Union Rail Road. Thomas’s story is that he did not want to get shot and killed, his solution was to stay on base and and study the aircraft repair manual and take the test, which he passed. It was strange as he repaired the planes because he knew that the majority of them would not return. I guess I should look up the statistics on how many made it back to England and what was the most bombing missions that one airplane had. My mother lived with her mother in law, Gertrude O’Rourke Dowd until he returned. The interesting thing to me about my grandmothers Citizenship Paper is that she applied for her citizenship after my grandfather had died. She seems to have remarried in the same year, was this a marriage of conveyance? Was she subject to deportation with my mother after Willi’s death? I do remember her second husband, William Krah, was he a friend of the family or did he work with my grandfather? Anna was thirty seven at the time, she appears to be much older. I also had never seen this records before my father died in 2004. Did he think that no one would be interested in this document. Anna died in 1969, from leukemia and her husband William Krah died a few years later from heart disease and prostate cancer. They never had children and my parents took care of him until he was to weak and sick and was admitted to a Nursing Home for a few months before his death. Here is a picture of me taken yesterday. There was 21.5 inches of snow and I am standing in my street, waiting for the snow plow. This reminded me of the Thanksgiving Snow Storm in 1950, that was the most snow about 27.8 or there about. I was four at the time, and what I remember of that Friday night was waiting and looking out the front door waiting for my dad to come home. He worked for the Union Railroad, he was an electrician and his job included the motor work on the on the trains. I remember the cars spinning their wheels trying to get up the street. He was hours late and my mother was worried. It seemed like forever and I can recall he got home about 8 PM. The buses had stopped running and he had to walk about four miles from the roundhouse to home. My mother and I went to the local store the next day and she pulled me on a sled. I seemed to me it was a lot of snow, but being a child any amount would seem like a lot. I found out much later that it was indeed a lot of snow. I haven't found any pictures of my parents of that Thanksgiving storm. I was reading a newly found blog Ancestral Archaeologist , when I came upon a thought. One of the 52 week of new ideas had been to write about myself and today it struck me.....Between 1972 and 1980 Chuck and I had moved and lived in Asia, Europe, PA, IA, TX and New Jersey. If any of my descendants would search my census records they would find my name only listed in the same house in Pennsylvania. They would have no idea where I had been. Chuck and Claudia circa 1972.